"I believe in music the way some people believe in fairy tales." Young Freddie Highmore is already assembling an impressive filmography, with Charlie and the Chocolate Factory, Finding Neverland, The Spiderwick Chronicles and The Golden Compass, among others, to his credit. He really gets to strut his stuff in August Rush, which depends heavily on his ability to generate believability in his highly unusual character. It's an intriguing performance that's half savant and half lost child, and it certainly suggests a bright future career for him. Highmore stars as Evan Taylor, a boy stuck in an orphanage in upstate New York. He has a gift of hearing music in the world around him, and he is determined that the music will lead him to his parents, about whom he knows nothing, including whether they're even alive. Those parents are Louis Connelly (Jonathan Rhys Meyers), a guitarist in a rock band, and cellist Lyla Novacek (Keri Russell), who connected in a one night stand that resulted in Evan's birth. The film follows the trio as they blindly make their way towards one another, pushed by a longing they do not understand and the music that drives them. It's an odd tale that veers into fantasy more than once, and it's heavily dependent on extreme coincidences, to a level usually found only in novels by Charles Dickens. That's explained (or glossed over, if you prefer) by a notion of harmonics in life that stand in for fate and lead those who are able to hear or feel them to their destinies, regardless of the efforts made by others to keep them apart. Among those agents here is Wizard (Robin Williams), a Fagin-like character who heads a gang of young street musicians, hustlers and pickpockets, and who recognizes Evan's talents, dubs him "August Rush" for a stage name, and tries to make himself rich from these talents, regardless of what's in Evan's best interests. The comparison to Fagin is an apt one, since August Rush could be considered a modern-dress but music-sensitive version of Oliver Twist (which would certainly explain those Dickensian coincidences). What makes this all work and not devolve into laughableness is Highmore, who beautifully displays a Mozartean prodigy in a half-unconscious manner. The effects work makes his musical talents seem quite credible, but it's his innate understanding of the character that ties it together, combining desperation for family with devotion to the musical sounds that fill him and occasionally overwhelm him. At the same time, he offers a childlike glee at his various triumphs without being obnoxious or ridiculous. It's a thin tightrope but he does an admirably fine job. The rest of the cast is acquits themselves honorably as well, with Keri Russell being particularly solid as Evan's mother, who was told that he died at birth. Her agonized search for him, with few clues, will move any parent to tears. Also notable is Terrence Howard as a sympathetic social worker who tries to help Evan. One of the more surprisingly effective parts of the picture is Robin Williams, whose trademark fidgetiness is well-suited for the huckster Wizard. Always working an angle and more than ready to exploit Evan's talents, it's also apparent that he also cares deeply for the boy; when he must make a choice between his own self-interests and August's, he works the character into a bit of bravado as if trying to justify his acts to himself and August. Even when he is rough with August, his Wizard is immediately regretful and he reveals more about his character than he intends to do. While Williams is frequently annoying and smug in other films of recent years, he underplays on occasion here and it's far more effective than most such other appearances. The musical aspect of the film is handled well, with the determination to create and perform being at the heart of the central characters' quests. Those who cannot hear the music inevitably look at them as freaks, or as a sideline that amounts to nothing much. But the vital flow of life within them makes them one with the music, and almost makes the rather dubious events of the script credible. It's certainly enjoyable to those with a sensitivity to the arts, though those lacking such sensitivity may consider it equally a freak show. Image Transfer Review: The HD side features a 1080p picture encoded with VC-1. The main titles have some major noise around the letters, but otherwise the picture looks solid and with nominal artifacting. There are a number of sequences that are shot with fog or soft lighting, and they're admirably rendered. The black levels are rich and deep. The frequently seen sewer grates of New York City are rendered with rock solid clarity and no hint of aliasing. Audio Transfer Review: The only English language track is in TrueHD format, and it gives nice airy warmth to the outstanding score by Mark Mancina. August playing the organ in the church offers plenty of subsonics as well as outstanding reverb that puts one into a gigantic space. The suggestions of music in nature as well as city life come across with alternately ethereal and percussive naturalness. There's no complaint here whatsoever. The French and Spanish tracks are DD+ 5.1 rather than TrueHD, but they're nearly as good. Extras Review: The sole extras are a set of seven deleted scenes. These mostly offer additional character bits for Wizard, though there is one critical sequence that totally changes the meaning of the last shot we see of Williams in the film. Unfortunately, there's no "Play All" button for these deleted scenes. 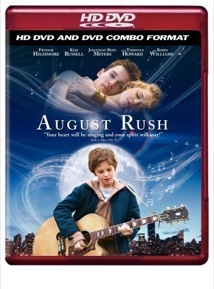 An often poignant and heartfelt fantasy about music and the longing for family, August Rush features an outstanding performance by young Freddie Highmore. Other than a few annoying glitches, the transfer is excellent.